Defence families are warmly welcomed into our Gleeson College Community! At Gleeson we believe that education has greatest impact when the College works in partnership with students and parents to enhance learning. 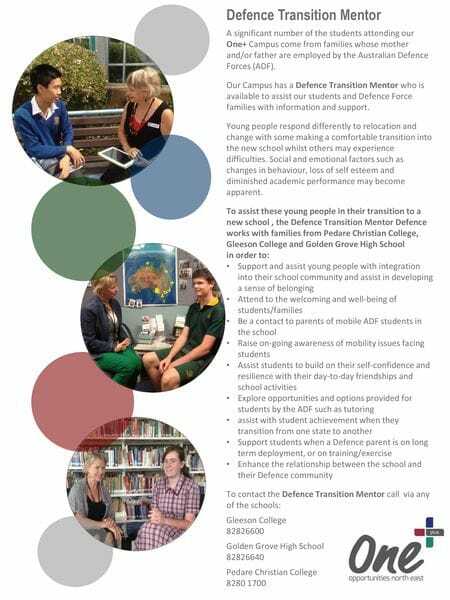 Our Defence Transition Mentor will welcome and assist students to develop a sense of belonging and streamline recognition for their prior learning. Your child will access extensive curriculum offerings, leading edge technologies and facilities. Our enthusiastic staff will nurture creative learning, faith, identity and well-being, building resilience and skills to foster positive relationships.